Making a switch from geology to Asian studies may not be the conventional path for an academic to take, but a fascination with Indonesian politics was enough for Gerry van Klinken. Now a research fellow with the 157-year-old KITLV (Royal Netherlands Institute of Southeast Asian and Caribbean Studies) in Leiden, van Klinken describes the move as "a big shift". Over ten years of teaching physics at universities in Malaysia and Indonesia, his passion for Asian culture and politics, and particularly Indonesia where he spent his early childhood, grew. So he decided to pursue a PhD in Indonesian history at Griffith University in Australia, which he completed in 1996. Since then he has taught and conducted research at universities in Brisbane, Sydney, Canberra, Yogyakarta and now Leiden. From 1998 he became a frequent media commentator on Indonesian current affairs. Born in the eastern part of the Netherlands in 1952, van Klinken spent his early childhood in Doom, a small island of Sorong in what is now known as West Papua, after his family moved there in 1956. His father was a police officer who trained would-be Papuan officers, though he accepted the role more for his enthusiasm to explore the then Dutch colony. The family moved back to the Netherlands in 1962, three years before West Papua's integration into the newly independent Indonesia. "But like any other Dutch family who had spent time in Indonesia, we found the Netherlands too small and too cold," the self-effacing scholar said. His family decided to move to Australia where they found open space and nicer weather. To earn a living, his father became a businessman. It was in Australia that van Klinken met Helene, who he married in 1976. The couple now have two grown up children, Ben and Rosie. During the early years of their marriage, van Klinken and his wife talked about making a trip to Indonesia, the country that thrilled him with childhood memories. So they departed for Indonesia, learnt Indonesian in Salatiga, Central Java, and made a trip through the archipelago as hippies in 1977. After receiving MSc in geophysics from Macquarie University in Sydney in 1978, van Klinkan aspired to teach at universities in Indonesia. However, since no jobs were available, he moved to Malaysia in 1979 and taught physics at universities for three years before moving back to Indonesia to teach physics at Satyawacana University, Central Java, in 1984 for seven years. It was during this period van Klinken mingled with Indonesian intellectuals such as George Junus Aditjondoro, Arief Budiman, Ariel Heryanto and student activists like Stanley Adi Prasetya and Andreas Harsono, who gradually bolstered his passion for Indonesian politics. 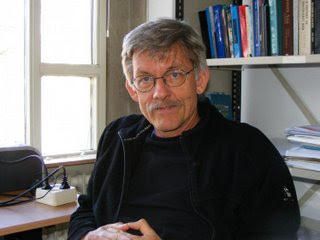 Van Klinken witnessed and involved himself in a new generation of student activism at the time of the controversial development of a dam in Kedungombo, Central Java -- a New Order development disaster that became a research topic for George Junus Aditjondro's PhD dissertation. "But it was the late Herbert Feith who really excited me about Indonesian study and influenced me seriously to switch to this area of study," van Klinken said. Herbert Feith was an Australian academic whose work on Indonesia was greatly referred to by many scholars. Van Klinken completed his PhD in Indonesian history from Griffith University with a dissertation on political biographies of three Indonesian Christian figures, Amir Syarifuddin, Kasimo and Sam Ratulangi. He later became editor of the Australian quarterly magazine Inside Indonesia (1996-2002), publishing stories on the people of Indonesia, their culture, politics, economy and environment. From 1999 to 2002 van Klinken became resident director in Yogyakarta for the Australian Consortium of In-Country Indonesian Studies (ACICIS). The Commission for Reception, Truth and Reconciliation in East Timor (CAVR) also recruited him as research advisor from 2002 to 2004. "Basically since 1998, I have been working on contemporary Indonesia. Ethnic and religious conflicts are really a new chapter in Indonesian history," he said, referring to violence that engulfed some areas in Indonesia after the collapse of the New Order regime. Van Klinken was especially disturbed by what he dubs "the silence in Jakarta" about ethnic cleansing in Central Kalimantan, where a sizable Madurese population was reportedly massacred and driven out of the territory during a terrible bloodbath with other ethnic groups in Central Kalimantan. Madurese figures in Jakarta like Amir Santoso, Didik Rachbini and Atmonegoro tried hard to speak on behalf of the victims but to no avail, van Klinken said. "So there was a crisis in the conception of Indonesian citizenship," he said. The Education, Internalization, and Implementation of Pancasila (P4) program that had been enforced for decades was called into question after the collapse of the New Order. Post-1998 also saw four streams of political changes, van Klinken said. First was the cosmopolitan movement, where elite intellectuals like Garin Nugroho produced movies about being an Indonesian at the time of the crisis. Second was the Islamist movement, which saw the mushrooming of Islamic-oriented political parties with narrow-minded conceptions of Indonesian citizenship. Third was the putra daerah, or "local son", a revival of pride in local identity, which also neglected migrants that had also lived in an area for a long time, such as the Madurese in Central Kalimantan. Fourth was the labor movement, with more worker unions established, along with a new generation of labor activists. "Another interesting phenomenon is the revival of Indonesian-Chinese identity. Many of my Indonesian-Chinese friends began to write about their own social identities and Chinese cultural inheritance in Indonesia," van Klinken said. He mentioned people like Ong Hok Ham, Liem Soei Liong, Andreas Susanto and Stanley Adi Prasetya. "For example, I asked human rights activist Liem Soei Liong to present his paper on Indonesia's human rights situation for an upcoming conference on the Indonesian reformasi movement at Universiteit van Amsterdam this May, but he refused because he said he wanted to write specifically about the Chinese now," van Klinken said. Liem Soei Liong is a co-founder and editor of the UK-based Tapol magazine, which regularly reports human rights abuses by Indonesian authorities. Van Klinken's passion for Indonesia has also been passed on to his wife. Helena is now completing her PhD at Queensland University in Australia. Her dissertation is about East Timorese children who were taken away to live in Indonesia. "There were mixed motives, human and religious motives and thousands of East Timorese children (were involved)," he said. There was also evidence that an emotional bond developed between Indonesian soldiers and Timorese youths during the Indonesian occupation. Back then many East Timorese youths were employed by the Indonesian army as Tenaga Bantuan Operasi (TBO) or Operational Force Assistants. Van Klinken said Alfredo Reinado, an East Timorese military renegade and rebels' leader who was killed during a recent failed coup in East Timor, was one such example. In May 2006, Reinado led a revolt against the government after its controversial dismissal of 600 soldiers in the newly independent country. Back then the young Reinado was a TBO and was taken to Indonesia by a soldier he had become close to. "But the soldier's family mistreated him as they considered him to be a burden, as they already had children to raise," van Klinken said. Kayapa Gerang Nulis Nang Bujur?